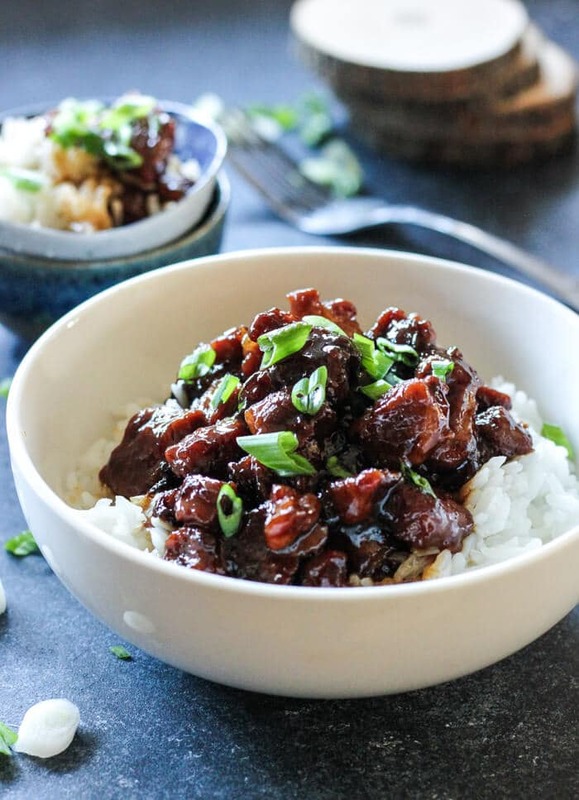 Flavor explosion in your plate-try this sticky caramelized pork with rice and you will enjoy every bite of it,i promise! What can i say about the most delicious pork i ever tried? A perfect balance of salt from soy sauce and brown sugar gives this dish an incredible taste! And when you simmer it for a while, it gives it that caramel effect, so beloved by everyone. Add some simple white rice and the dish is complete. 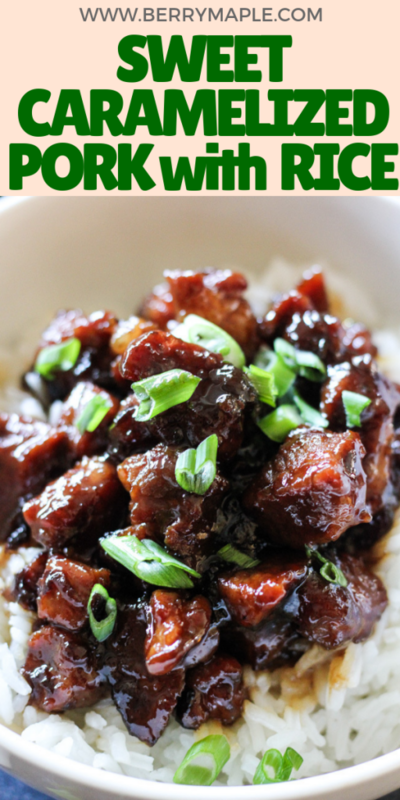 If you will serve it for dinner, don’t forget a glass of red dry wine that goes so well with caramelized pork! 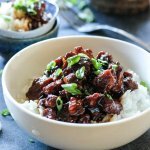 Flavor explosion in your plate-try this sticky caramelized pork and you will enjoy every bite of it,i promise! Chop the onion and cut pork in small pieces. Heat olive oil in a large skillet and cook onions and pork for about 5 minutes until the meat is well browned. This looks insanely, incredibly good. Sooo yummy! Thank you! Curious to know how will this recipe work with the chicken! It will stink, at first. Don’t judge it by that. It will look wrong, until it doesn’t. It will take longer than 30 minutes to carmalize. So glad to know I should keep going. I am trying this tonight. I am excited and still curious how a recipe so simple can be so memorable? This should be a keeper! I love keepers!!! Thanks for sharing. I have to echo Melanie. The recipe seemed odd to me, but it comes together beautifully! The pork is amazingly tender and the sauce is soo good! Took mine closer to an hour to caramelize, but so worth the wait. The only thing I will add next time is some red pepper flakes for a touch of heat. There will definitely be a next time. This sounds perfect! I love how it is paired with rice! Yum! Perfect for an alternative to takeout. Let me start out by saying I never review recipes. I usually just make them, file it away in my brain to make again if we like it or just forget about it. This is review worthy, especially since there aren’t many reviews, I had to let others know how awesome this is. Next, I was skeptical of this recipe. It’s not the typical Asian recipe I would make. No garlic, rice wine vinegar, ginger, hoisin, sesame seed oil…. I mixed the sauce recipe and just stared. I thought there is no way this will produce anything noteworthy. I tasted it. I still wasn’t sure, but knew it would reduce down. I was tempted to doctor it up but thought I would keep the recipe as is, knowing that if it was not good we had leftovers to eat. Spoiler alert, the leftovers were untouched. All I browned my onions and pork, added the sauce and let it bubble away. That was nice, to just walk away basically. I would come back, stare at this unimpressive pork boiling in a light brown water, stir and walk away. It took longer than 30 minutes fit mine to reduce to my liking, probably 45 minutes. Then, it was magical. This tan water turned into the sticky sweet caramelized goodness that was promised. My pork turned from unappetizing white cubes to golden brown deliciousness. And the taste? Far from bland. The onions become part of the sauce and lend flavor. The fish sauce leaves the pork almost smoky somehow, and it has the perfect balance of salty and sweet. I fixed it with rice and sweet carrots. I’m so happy I found this recipe, and trusted it enough to try it, and leave the recipe alone, which if you knew me you would know exactly how difficult this is. Will definitely file this away to fix again! Thank you! Thank you SO MUCH for your kind words! Thank you for taking your time to write your amazing review, it means the world to me, Melanie! oh my goodness! I’m pinning this and I can’t wait to try it! Thank you, hope you will like it! Love how easy this recipe is. I love Asian inspired recipes that are bursting with flavor! These pictures are beautiful! The pork looks so juicy and saucy (does that sound dirty? haha) and not at all dry. Gorgeous! This is one of those meals that I crave, I love this recipe and will be making it this week! Thank you! This looks really good…something I can see myself eating for dinner AND leftovers for lunch! Looks like the perfect lunch bowl!! Meat covered in sticky sauces are one of my favorite things – totally pinning this for later! Love the flavors here! What a great weeknight recipe – and thanks for reminding me about the glass of wine to go along with it! You can NEVER go wrong with delicious pork. This dish sounds fantastic, and the leftovers would be great for lunch too. This looks like total comfort food! 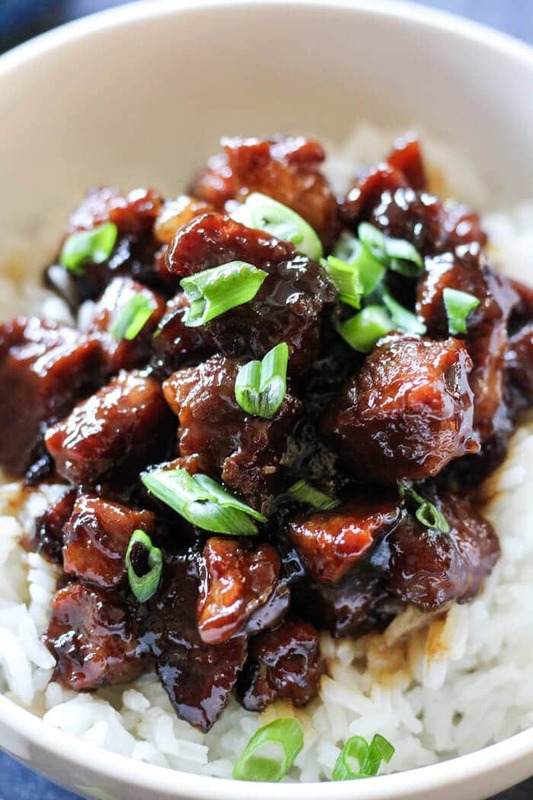 I love those sticky sweet sauces with pork – YUM! Wow! This looks delicious – so sticky and really full of flavour. I think pork goes so well in recipes like this. My husband would love this!!! And we both love a good rice bowl. YUM! My husband and stepson would be all over this dish! Sweet, salty, caramelized, I can see them licking their lips!